The story begins with the installation of a 6.5 ton black granite monument engraved with the "Protestant" interpretation of the text of the Ten Commandments. It is derived from the Bible in Exodus 20. It was placed in the courthouse lawn in the city of Starke, FL in 2012-MAY-03 -- the National Day of Prayer. Whenever such a monument is installed, the owners have to decide which version of the Ten Commandments to use. The main Protestant and Roman Catholic versions differ. This formula avoids mention of the prohibition on making "graven images" as found in Catholic statues and crucifixes. It also avoids mention of the curse by God on any man who hates God and the transfer of that sin to his innocent children, grandchildren, great-grandchildren, and great-great-grandchildren. Such a transfer -- in which the innocent are punished for the sins of the guilty -- is considered quite brutal and immoral by most faith groups and secular systems of ethics. It is also negated elsewhere in the Bible. Split Exodus 20:17 into the 9th and 10th Commandments. Exodus 20:4 to contain the 2nd Commandment. All of Exodus 20:17 to contain the 10th Commandment. "Something like this can make you wonder -- and you shouldn't have to -- whether you are going to walk into this building and get a fair trial." Cooney later joined American Atheists as a plaintiff in a lawsuit filed on 2012-MAY-24 in a federal District Court. They asked that the monument be removed from the courthouse grounds because it attempts to establish a religion -- that of Protestant Christianity. They argued that this violates the separation of church and state principle as defined in the First Amendment of the U.S. Constitution. It also violates the Florida Constitution. The Community Men's Fellowship -- the Christian group that had the monument fabricated and installed at the courthouse -- issued a countersuit stating that the area is a "free speech zone" or a "public forum." They asked that the monument be allowed to stay. They maintained that the Ten Commandments were not really a religious artifact, but were a statement of the fundamental principles that underlie American's national existence and identity. This is very similar to dozens of instances in the U.S. where the Commandments, engraved in rock, were displayed on public land. As usual, both sides were certain of the correctness and legal status of their claim. But this time, the trial took an unexpected turn. The plaintiffs and defendants were ordered to engage in mediation. They selected, as a mediator, Alexandra (Sandra) Henrick. She is an attorney, trial lawyer, teacher of law, Presbyterian minister, and experienced mediator. Something unique happened. On 2013-MAY-30, both sides agreed to terminate their lawsuits. 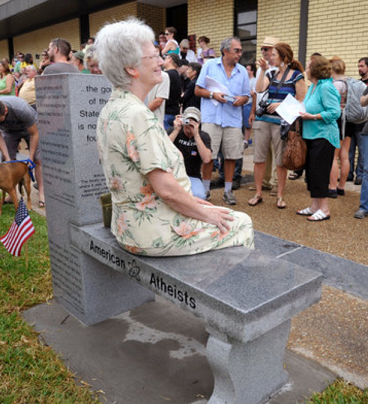 They decided that the Ten Commandments could stay and that American Atheists would be allowed to install a monument to Atheism in the same courtyard. This became the first monument ever to be placed by an Atheist group on public land in the U.S.
"An atheist believes that a hospital should be built instead of a church. An atheist believes that a deed must be done rather than a prayer said. An atheist strives for involvement in life and not escape into death. He wants disease conquered, poverty banished, and war eliminated." Two other sides contain quotes by Thomas Jefferson, Benjamin Franklin, John Adams, as well as the 1797 United States Treaty with Tripoli. The latter says that the United States in no way is a Christian nation. It was unanimously passed by the federal Senate. On the right side of the pillar are quotations from elsewhere in the Bible which state the mandatory penalty for a person who breaks a commandment. Most often, the punishment is execution. These quotes were apparently added to show the brutal nature of the Ten Commandments. American Atheists has announced that they have funding from an anonymous donor to pay for 50 more atheist monuments across the U.S.
"Today, America's Atheists take another step forward in our struggle for equality, and we, as a nation, take a step forward toward the American ideal of a pluralistic, melting-pot society. Across our country, public lands are littered with religious monuments, most notably those depicting the Ten Commandments, like the one I stand beside. Out of ignorance, most people believe the Ten Commandments to be some bland benevolent set of ethics on which all nice people can agree. These are the people who have never read the Bible, nor do they understand the context in which the Commandment are given. This is true Americanism, where widely different views can all be a part of the American experience in a great crucible on freedom. In acceptance of our many differences, we fulfill the vision of our founders that we are truly, despite our disagreements, 'One Nation, Indivisible.' That we have become a union of free people. And that in our union is our strength. That we are a nation that is 'Out of Many One'. ..."
Let those doubters who will not accept the reality that religious belief and Atheism can share the same plot of common ground come to the Bradford County Courthouse in Starke, Florida, and there witness, experience. and celebrate the Starke [sic] Reality that our future can be better than our past and that we are, and we will continue to be, a free, unified, and powerful people. "The Ten Commandments deserve to be ignored," American Atheist magazine, 2013-4th Quarter, Pages 7 & 8.